Forget mixing bowls! 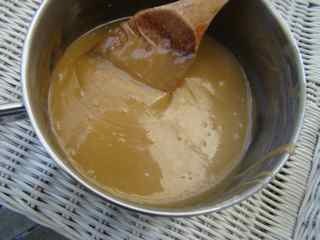 We use roomy saucepots for making cake batter. 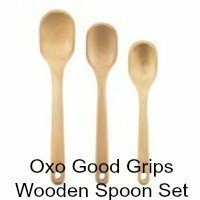 A sturdy wooden spoon is essential! Try to get one like a flat spatula. 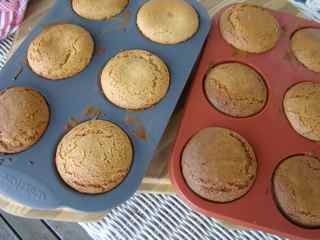 You'll need a 12 cup Silicone Muffin Pan. Don't scrimp - Be sure to pay a little more and get a Premium Food grade silicone product. 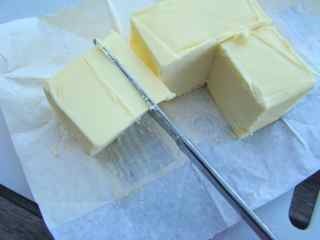 Measure the block or stick of butter by cutting it to size. 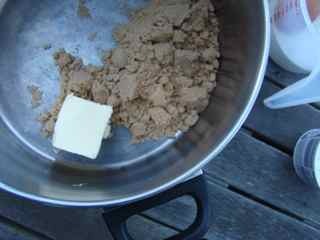 I bought a large 16 ounces block of butter but for this recipe required just 3 ounces. See how the block's been cut into half - that's 8 ounces, then quarter - that's 4 oz. The knife is now positioned at the 3/4 mark to obtain 3 ounces of butter. 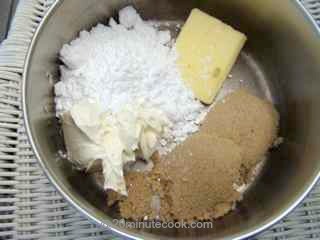 The left over 1 ounce will be used for the frosting as discussed below. There's the tub of cream cheese for the frosting. 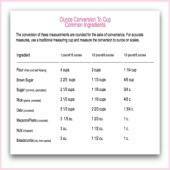 We'll show you below how to measure a small quantity. 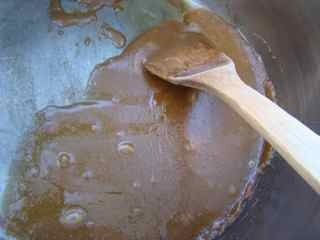 Melt the butter and sugar in the saucepot. 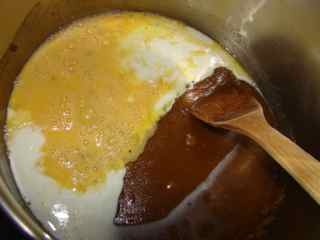 Keep stirring even after the heat has been turned off, till it becomes a thick smooth caramel. Now, toss in the flour. Don't be precious about it. No, I don't sift as modern packaged flour is fine and not clumpy. 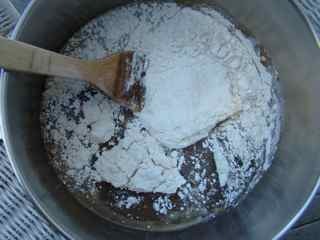 Fold in the flour into the mixture. 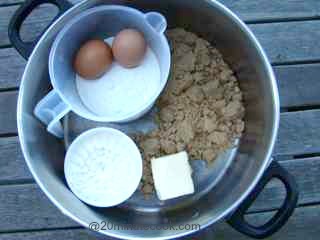 I use the edge of the wooden spoon to combine the flour into the batter. 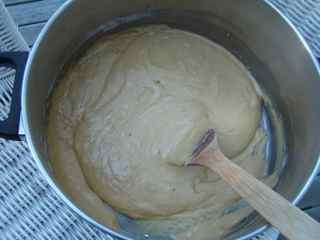 The cake batter is ready when there are no longer any clumps. 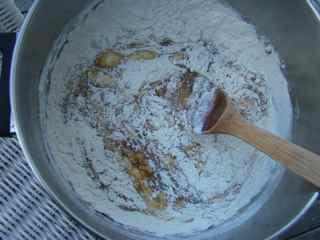 See how the batter is smooth and light. 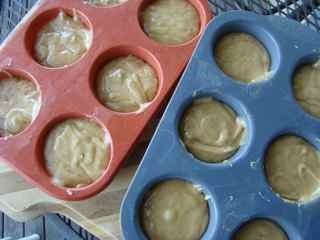 Spoon the batter into cupcake molds. You can see here I've used non-stick silicone molds. 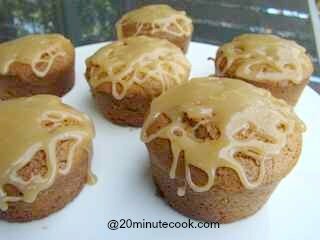 Pop them into the preheated oven to bake for the requisite time. Here they are! Beautifully risen! When they can be handled, use the back of a blunt knife to run around the edges of the mold to prevent them sticking to the walls. Don't ice till they're completely cool. When you make cupcakes, they're just not "finished" until they're dressed with at least some frosting. 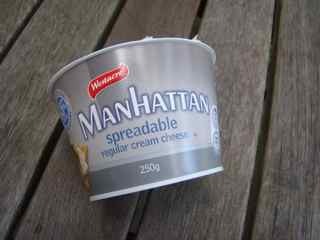 Here's the tub of cream cheese showing a weight of 250 grams or 8 ounces. 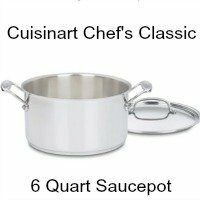 The recipe calls for 70 grams or 2 1/2 ounce. 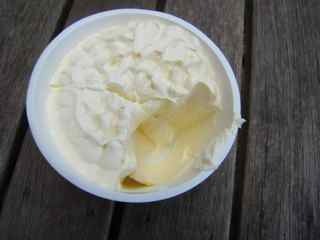 Here is how I measured 70 grams or 2 1/2 ounce of cream cheese. I marked off quarters of the tub - that's about 62.5 gm or 2 oz. You can see how I cut out 1/4 of the tub -that's 2 oz, then another small chunk (1/4 of the quarter) for the extra required 1/2 ounce. 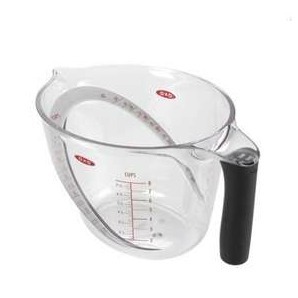 That's how you can measure without the use of scales. It's quick, accurate and best of all, not fiddly and no extra washing up. Here's the extra one ounce of butter required. I cut this from a 16 oz block by marking 1/2 of the amount as 8 oz, then 1/2 that again as 4 oz, followed by 1/4 of the 4 oz portion is 1 oz. 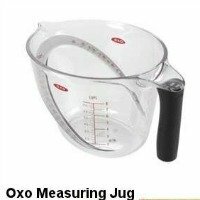 You must have a clear measuring jug in your kitchen. Be sure it will hold at least 4 cups. 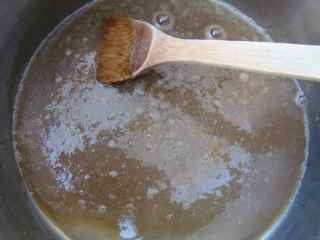 Keep stirring till there are no lumps and is a thick smooth mixture. Work quickly now as it will harden as it cools. Drizzle over the cool cupcakes.